NEBK and the U.S. Boxer Association extends their gratitude to the following companies and individuals for making this event happen with their donations. With these supporters and the trophy sponsors, NEBK has been able to host the national Sieger Show at a national level...So check out these companies who support our endeavors in the dogsport world for our Boxers! Just as the name says...the Honest Kitchen cooks up all natural dog and cat food. So the Kitchen sent some tasty treats and BIG meal boxes to raffle off at the show. Thank you goes out to the Honest Kitchen for supporting NEBK and U.S. Boxer Association! Boxer von Dalmatien - sponsor of event and trophies. Thank you. Royal Screen Printing is the proud local sponsor of the sieger show with their custom shirts. This company can do all your printing needs for that special event. NEBK thanks Royal Screen Printing for their support of the Sieger Show and events. Wear royal! Oma's Pride hails from Connecticut specializing in natural food for your dog. Proud sponsor of the national Sieger show by contributing "goodie bags" to each exhibitor and contributing to the show event. Oma's Pride will be at the show to answer any questions about their products. NEBK and US Boxer Association thanks Oma's Pride for their sponsorship of the events! Fulcer Event Services - This company provides dog event services with an experienced crew led by Renee and Lloyd Fulcer. Thank you for sponsoring the trophies. Sponsor of the Best Male and USA BOX Sieger fawn male trophies come from the California boxer club...Boxers West. Thank you for your support. Sponsor of event and trophies from East Wisconsin Working Boxer Klub. Thank you our boxer club in the Central Region! Sponsor of the Sieger Show is Max 200, a company that specializes in your agility and dog obedience equipment needs. Thanks for the contributions to the US Boxer Association National Event! Sponsor of Best in Show trophy. Thanks Colleen of LockNLoad Boxers kennel. Sponsor of the Best Female and USA BOX Sieger Brindle Female trophies is Bunny R. NEBK thanks you for donating to the event. Visit Valley Vet Supply who contributed beautiful leather leads and collars to the event. Check out Ray Allen K9 site for your boxer. Contributed gift certificates to help sponsor the events. Sponsor of the Working Fawn Male and Working Fawn Female. 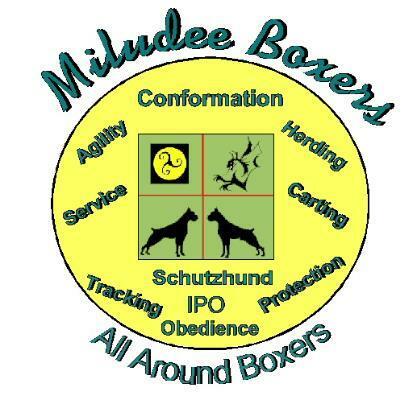 Thanks Millie S. of Miludee Boxers. Sponsor of Open Fawn Male and Intermediate Fawn Male trophies is Reegan Ray of Great Expectations Boxers from California. Contributions from Hallmark K9 supplies for the event are whips and other equipment for dogsports. Event sponsor, BESPOKE'S K9, and Paige Ayling sponsored USA Box Brindle Male trophy and Intermediate Brindle Male trophy. Thank you to the Ayling family for your support. Dogwise has been generous to our boxer show and contributed various dog training items. Sponsor of the US Boxer Association Siegerin Fawn Female trophy hails from KaCee Boxers of Ocala, Florida and the South East Boxer Klub. Thank you for supporting the event. Thank you Karen Suarez of KaCee Boxers in Ocala, Florida and South East Florida Boxer Klub for your support.